when Nancy Pelosi decided to kill the Colombia free trade agreement. our best ally in Latin America. unemployment insurance, the deal remained stalled in Congress. Apparently the problem was that Democrats kept getting their way. 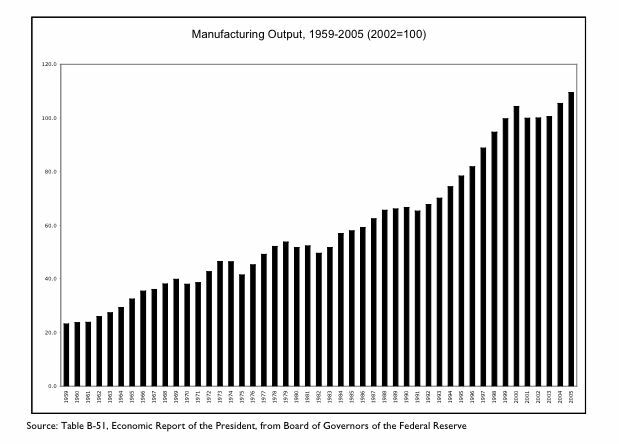 We can see that since the passage of NAFTA in the mid-1990s that US manufacturing output has, uh, has.... can that be right? Columbia imports into the US are mostly tariff free. It is the US exports that need tariff reductions. It makes no sense that trade unions -please carefully note the qualifier trade unions - are against the Columbian Free Trade agreement since trade union members make real stuff like bulldozers that could be exported to Columbia. It must be the non-trade unions like government workers that Pelosi bending over for. Talk about the tail wagging the dog. How about Pelosi not wanting anything that might show favorably on Bush? Pelosi is more interested in playing political games than in doing the job for which she was elected. That chart is irrelevant to a Democrat, since it focuses on manufacturing OUTPUT. They look at input, and the I think number of manufacturing jobs has dropped about 15% since NAFTA. Of course, computers, hydraulics, electric motors, etc., are as much the bane of Democrats in this regards as foreign labor. Someone should did up Tesla and kill him for all the harm he did to manual laborers. Coyote, the biggest contrabution you've made to advancement of thought on this blog is your correct labeling of the left's economic beliefs as superstition equal to someone thinking that the earth is flat resting on turtles that "go all the way down." No argument that there is only superstition behind this stuff (and the gorebull warming stuff) but I have begun to think that we are (and I *am* guilty) being grossly unfair when we use the "cargo cult" label. Those Islanders have profound _reasons_ for believing what they do (did?). I'm not sure that can be said of the current crop of wild-eyed maniacs. The trade agreement got killed? Crap. I was hoping it would go through and act as a catalyst for others in South America. My brain isn't working this morning.... whatever happened with CAFTA? I'm continually amazed at the number of people who out-and-out refuse to believe me when I tell them US manufacturing output is at an all-time high. What are you going to believe, empirical reports with big and confusing numbers or the talking heads ? Those talking heads must be smarter because they're on television, the font of all modern knowledge. Huge fan of the blog. However, your argument is inaccurate. Manufacturing productivity is going up, not employment, and your chart implies that as growth increases, employment does. In fact, manufacturing employment has been going down for years and is long term going to end up like farming - 2ish percent of the population. Todd, nothing innaccurate about this post. There is nothing here about employment--up or down. I promise you coyote knows manufacturing employment is going down. And we should all be thankful for it. I love how there is so much talk about losing manufacturing jobs to NAFTA countries but absolutely NONE about losing manufacturing jobs to CHINA! WTF? China is the real threat of job loss and they do it without the NAFTA special tariff provisions. It is China with real bad news human rights records, it is China with real bad new environmental record. Why is everyone talking about how we lost jobs to Mexico but no one is talking about China? You are asking the Democrats to behave rationally; you should know better! As somebody who does work in manufacturing, I can tell you one of the big things that has led to a lower number of people in manufacturing is automation - the first shop I worked in had 4 people working there - the 3 owners and me. One of my bosses once told me they produce more now with CNC machines than when their father owned the place and it was all manual machines, and had 30 guys working there. They also make things now they couldn't when it was a manual shop. Another story: Heard this one in college - a transfer line making gate valves run by 200 women was replaced by 7 VMC's. And the reject rate went down too. Starting in the late 80's, CNC machine tools have seen an explosion in small shops, so much so, that if you want to start a shop today, you HAVE to have one, or you're not going to be able to compete on price. Is that a graph of output or of value added? If you replace plants that make $100 worth of product a minute from $20 worth of metal stock with plants that assemble $160 worth of foreign-made parts into $200 worth of product/minute, you've doubled the output, but cut the value added and the manufacturing actually done here by 50%. Not that there's anything wrong with making the parts wherever it can be done cheapest. The impetus for current protectionist sentiment -- from Democrats or otherwise -- is that globalization hasn't treated all its participants well. I know, for example, that one of the links in the discussion above leads to an article claiming great median income gains in the U.S., but those gains turn out to be about 1% a year while productivity for the same period gained more than 2% a year. The people who are more productive aren't always getting the income.
" A new research paper by Ian Dew-Becker and Robert Gordon of Northwestern University, "Where Did the Productivity Growth Go?," gives the details. Between 1972 and 2001 the wage and salary income of Americans at the 90th percentile of the income distribution rose only 34 percent, or about 1 percent per year. So being in the top 10 percent of the income distribution, like being a college graduate, wasn't a ticket to big income gains.
" But income at the 99th percentile rose 87 percent; income at the 99.9th percentile rose 181 percent; and income at the 99.99th percentile rose 497 percent. No, that's not a misprint.
" Just to give you a sense of who we're talking about: the nonpartisan Tax Policy Center estimates that this year the 99th percentile will correspond to an income of $402,306, and the 99.9th percentile to an income of $1,672,726. The center doesn't give a number for the 99.99th percentile, but it's probably well over $6 million a year." Trying to make the conversation about globalization into a more/less manufacturing measurement ignores that larger picture. It's even simplistic to say that U.S. trade policies like NAFTA created that "giant sucking sound" of jobs headed to Mexico (for example). And couching the discussion in terms provided by the political posturing around this is even worse. Politicians barely get a sound byte's worth of attention now (Ralph Nader complains he has been confined to a sound "bark"). The expectation that such discourse would resemble reason isn't rational itself. Now, a little background: NAFTA was authored by the G.H.W. Bush administration, but passed during the Clinton administration, with Newt Gingrich's enthusiastic help, after the Clintons added labor and environmental standards (seldom, if ever enforced) to the agreement. Among other things, after it caused capital flight (remember the $20 billion Clinton bailout?) NAFTA gave the U.S. the right to export things like Iowa corn to Mexico. Since U.S. farmers use technologically advanced tractors and combines, and put enough petroleum-based fertilizer on their corn to create a 15 mile dead zone at the mouth of the Mississippi -- and considering that 40% of U.S. agricultural income is subsidy -- saying this corn is cheaper than Mexican small farmer's corn is an understatement. So any subsistence Mexican corn farmers impertinent enough to think they could compete with ADM or Cargill were quickly corrected and put out of business. Remember too, that half the population of Mexico gets by on less than $4 a day. Pretty cruel to put those folks out of business, if you ask me, but hey, that's capitalism! Now if we could only get rid of all these danged illegal aliens coming up here to work and feed their families! (Who actually are lowering the low end of the wage scale.) Why what we need to protect us against Saudis entering the country on student visas to attack us with box cutters is a border fence to keep out Mexican laborers (and let's invade Iraq, while we're at it)! Yes, "conservatives" have been ever so sensible. For those puzzled by this statement: This is sarcasm. Part of the joke is that the U.S. pretends to be the innocent victim of illegals, even though for more than a generation it has sponsored proxy wars in Central America (creating refugees) and now has shoved NAFTA down Mexico's throat (creating economic refugees). IMHO, This issue is as much moral as it is economic. The movement to lower tariffs in the third world -- promoted by both Democrats and Republicans, but far more aggressively by the right -- is roughly comparable to asking an infant to fight a heavyweight boxer. The trouble is *not* that the boxer won't win the fight. As Ha Joon Chang's excellent "Bad Samaritans: The Myth of Free Trade and the Secret History of Capitalism" reveals, the real issue is whether we are going to bully overseas markets into allowing in our goods when they have what amounts to infant industries. The very zenith and apotheosis of this principle is Iraq. See http://www.harpers.org/archive/2004/09/0080197 for Naomi Klein's excellent "Baghdad year zero: Pillaging Iraq in pursuit of a neocon utopia." Iraqis have literally zero tariffs, and ... 60% unemployment. So maybe lower tariffs aren't the whole reason for economic success...? Forcing our goods down the throats of "lesser" peoples is an American tradition -- think of Admiral Perry in Tokyo harbor. But, as Dr. Chang's book reveals, Americans and other developed nations have historically had no qualms about protecting their infant industries. They have practiced exactly the kind of protectionism the free traders decry in the infant industry economies until they felt equal to the global market. Chang also reveals that the countries who adopted the kind of "free trade" policies heavily promoted by "conservative" U.S. policy, the World Bank, IMF, etc., fared far worse than those who practiced protectionism. IMHO, The real question here is whether -- in the age of terrorism -- we can continue to believe stoking global economic instability in the name of free trade remains a viable policy. Or could (gasp) the consideration of others have a role to play. Yes, "conservatives" are excellent at sticking up for their own interests ("My precious!") but what happens if we're all in this thing together? Could treating others as we'd like to be treated be sound economics, not just be the foundation of morality? Even the classical economic theories cited in support of globalizers -- things like Ricardo's "comparative advantage" -- are typically distorted. For his example to work, Ricardo assumed immobile labor and capital. For those of you interested in real economics rather than political posturing, I recommend a look at former World Bank economist Herman Daly's "Beyond Growth." It's a real eye-opener, and gives the lie to both right and left, as currently constituted. As for whether "The Democratic Party has nothing to do with economics. They are entirely devoid of its understandingâ€¦" (markm) -- As is typical for "conservatives" (what on earth is conserved? )this strains at a gnat, and swallows a camel. For the answer, I recommend Paul Krugman's "Peddling Prosperity." You may disagree with what he has to say, but he can really clarify the discussion. The book is not really that partisan, either. It's not too kind to the Clintons. Anyway, the deficit sucked all the oxygen out of the capital markets, so the Reagan "miracle" meant capital spending -- the real engine of future economic growth -- was flat. Anyway, for someone on this blog to write that, as far as economics goes, the Democrats have sinned... Well, let's just say he needs to deal with the beam in his own eye rather than the motes in the lefties' eyes. You may remember that Reagan's budget director, David Stockman, was interviewed after he left the administration, and he admitted that "Supply Side" economics was bull feces simply cooked up to excuse reducing the top brackets in the income taxes. Incidentally, Stockman was in the news recently, being led away in handcuffs for securities fraud... I couldn't make it up. Further evidence of the bankruptcy of "conservative" economic thought: when Reagan came into office, the U.S. was the world's largest creditor. When he left, it was the world's largest debtor. U.S. trade was in surplus when he entered, in deficit when he left. You can say the Democrats screwed up, and certainly find many examples of this, but overall, Jimmy Carter's solar collectors on the White House and speed and gas mileage restrictions on U.S. autos are looking more and more prescient. The only thing propping up Reaganist policies are the paid flacks from Heritage, AEI and Cato, and the naive "conservatives" like those who write here about how ignorant are the Democrats (not that they are such smarties either -- the Democrats went along with lots of Reagan's brilliant ideas. Like deregulating the S&Ls... Remember?). Incidentally, to give you an idea of how honest the estimation of Reagan's presidency is: did you know that, except for Nixon's, his administration had the most indictments for malfeasance in office in U.S. history? The supposedly "slick Willie" crooked Clintons had zero, count 'em zero such indictments.